There have been a couple of posts on my blog about the long term ownership of a Vauxhall Astra and a Ford Focus, both diesels, very similar specs, used in a similar way. See here and here. The Focus is four years younger than the Astra, and has done half the mileage. But recently it let itself down, it let me down, it let my local Ford dealer down, and it let down Ford UK. See this picture to the left? See the small amount of corrosion on the terminals? That cost me £639. Yes. £639! One wet morning recently (are there any other sorts of morning recently?) I set off in the Focus on the school run only to find the wipers were not working. My local Ford Dealer (understandably) took a day to track down the fault. In the passenger side foot-well, behind the glove box, resides a fusebox. It is a big lump of plastic with fuse holders and some sockets into which plugs the wiring loom. As you can see above, somehow the terminals for the wiper connection had corroded and failed. 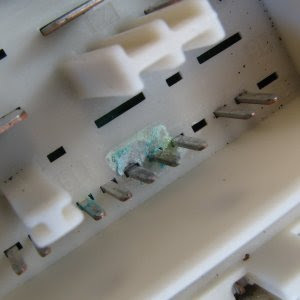 The dealer didn't give us the choice to just clean up this corrosion, but ploughed on and replaced the fuse box at a cost of £380 odd (or over 2 Xbox360's worth as I like to think of it). They found no evidence of a leak on the foot-well, so how it happened is a mystery. I have subsequently approached Ford about the resulting alarming bill of £639, but to no avail. The car is obviously out of warranty. They are unashamed of the ridiculous cost of this lump of plastic. The dealership sticks to it's idea that no repair could have been attempted. So I've got to take it on the chin. No explanation has been put forward as to how this happened, so there's no reason think it won't happen again. I doubt it, as I think the fault must have originated in the manufacturing process. I'd love to hear from anyone else who has experienced a similar problem. I keep thinking that if this fault had manifested itself on the motorway at 70mph in the fast lane on a very wet day, then I would have had a much harder time of it. At least only my wallet got hurt this time. "Epic fail", Ford... yet another round in the fight to my reliable Astra! I wrote this article a few years ago now, and I must say it was a cathartic exercise to try and make myself feel a little better about this, um, misfortune. However, in recent times I have been contacted by several people in exactly the same position - I was not alone! It seems extremely probable that the fault is caused in fact by condensation produced by the car's air-con dripping from the glove box onto the unprotected fuse box. In other words a serious design fault. For this, Ford are regularly charging somewhere between £700 to £1000 to put it right - this does not seem fair, now does it? Ford Focus owners can check on parts pricing with their local dealer, or try Partsgeek for Ford Focus replacement parts online. Whichever Focus model they own, there are always plenty of parts options online, as well as helpful instructions for replacing Ford Focus parts.